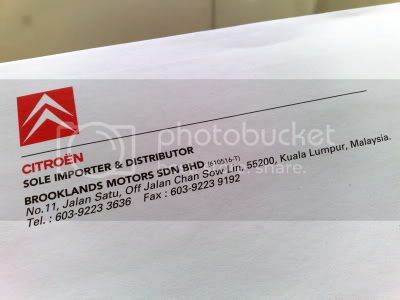 Over the weekend, I sent my sister’s car, Citroën Xsara Picasso, to Brooklands Motors Sdn Bhd for a routine service. It is situated along Jalan Chan Sow Lin in Kuala Lumpur. The building is pretty big and looks pretty good from outside. In the building, there are service centre, showroom and customer lounge (a hangout place for customers whose car is in for servicing or repairing job). The furniture in the building are well equipped with lavish designs and red sofas (same colours as their logo). Pretty impressive, I would say. However, there’s one thing that I’m not satisfied with at all; that is their customer service. They are a bunch of dumbwits, to begin with. They don’t bother to smile. They don’t bother to look at their customers during conversation. They can’t converse properly. They will make you wait without any proper explanations. Even Hyundai provides a better service than they (Brooklands) do even though Hyundai does not have the funds/budgets for any cool buildings to accommodate their customers’ needs. As far as I know, Toyota (in Puchong) as well as Mercedes Benz (in Petaling Jaya) provide good services. They too have the same concept as Citroën (nice building, customer lounge, free drinks, free WiFi connection etc.) but I just don’t understand why Citroën could not provide a good service to their customers. It does not reflects to their brand as an international continental car maker. Perhaps, it is due to their stupid management and their stupid Service Manager who is not capable of managing his staffs. Maybe, Citroën should cancel Brooklands’ appointment as the ‘Sole Importer & Dsitributor’ in Malaysia and give it to more deserving candidate. I bet there are others who could do a better job than they do.